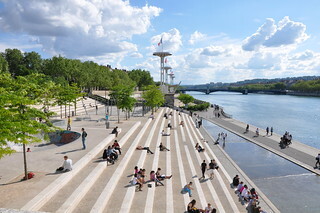 Lyon France his the third largest city in France after Paris and Marseilles. It has plenty of interesting sites to see. 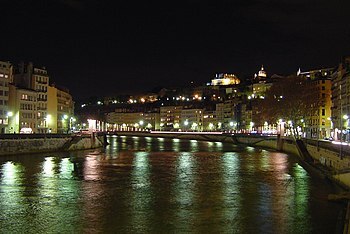 There are 30 bridges that cross the Rhone and Saone River in Lyon. Get a Lyon city card at the tourism office. Start with a tour on the Open-top bus or a riverboat tour. 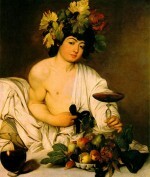 Then head over to the Museum of Fine Arts (Musée des Beaux Arts). I love Old Lyon (Vieux Lyon) with Renaissance buildings, and Rue de la République, Lyon’s main shopping street. Vieux Lyon is a UNESCO World Heritage site. 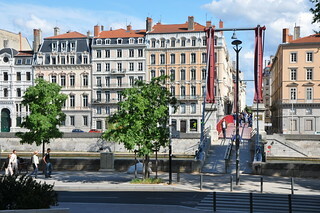 Lyon, was the capital of the Gauls and serves as the French world capital of gastronomy! It is actually called the “stomach of France” and has over 2000 restaurants with 15 Michelin stars. 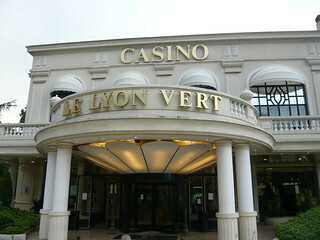 Make reservations for some of the outstanding Michelin-rated restaurants like Paul Bocuse, Leon de Lyon, Nicolas Le Bec, Auberge de I’lle and La Rotonde at the Le Lyon Vert Casino. Culinary and architectural heritage make Lyon a pleasant Vino con Vista destination with Beaujolais to the north and COtes du Rhone to the souuth. 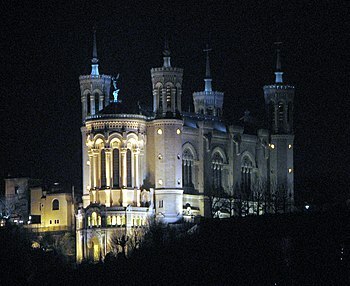 It is strategically located on Fourviere Hill with panoramic vistas of the Rhone and Saone rivers. In December, there is an outstanding four-day Festival of Lights. 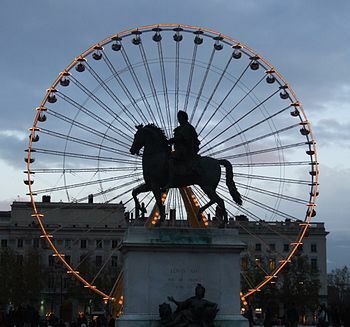 Stay near the Place Bellecour, a lovely square between the Rhone and Saone Rivers where you will find a statue of Louis XIVth and two fabulous allegorical river statues at the base of the monument. 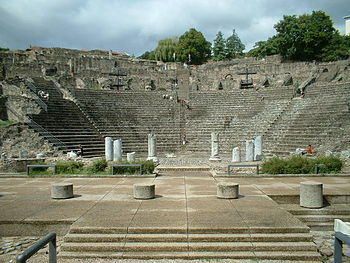 Lyon (Lugdunum) was founded as a Roman city in 43 BC and has two amphitheaters built into the hillside. Visit the Gallo-Roman Museum to admire sculptures, paintings and a bronze transcript of a speech given by Emperor Claudius. 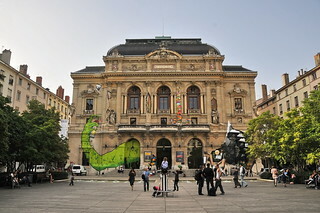 There is also an interesting Lyon Musee des Beaux Arts. It is located in a lavish 17th century palace. 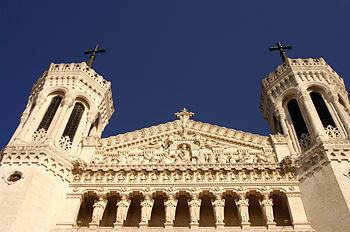 Wander over to the Basilique Notre Dame de Fourviere; Lyon’s favorite tourist destination. 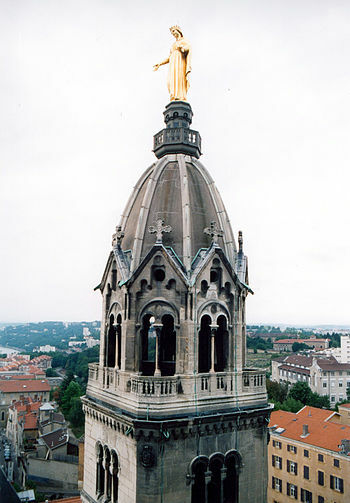 Visit the chapel dedicated to the Virgin Mary next to the Basilica with fantastic views. You can get tickets for the National Opera and visit the other interesting museums including: the Fabric Museum and the Lumiere Institute. They also have an annual Grand Lyon Film Festival. “Lyons bears exceptional testimony to the continuity of urban settlement over more than two millennia on a site of great commercial and strategic significance, where cultural traditions from many parts of Europe have come together to create a coherent and vigorous continuing community. 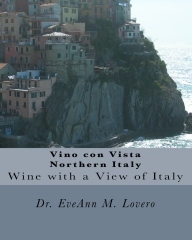 By virtue of the special way in which it has developed spatially, Lyons illustrates in an exceptional way the progress and evolution of architectural design and town planning over many centuries. The site of Lyons is dominated by two hills: to the west Fourvière and to the east Croix-Rousse, the latter prolonged by a peninsula formed by alluvial deposits laid down at the confluence of the two rivers. The Rhône is a strongly flowing river that comes from the Alps. The Saône, by contrast, is a gentler and more easily navigable river, linking Lyons with the plains of north-eastern France. 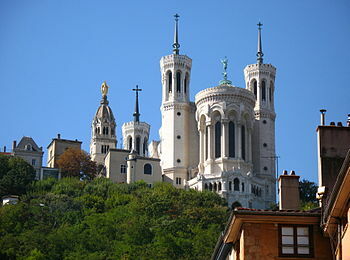 The present city began with the Roman settlement on Fourvière, although the area of the confluence had been used by man for many centuries before. The Roman town spread to Croix-Rousse and the Peninsula, but shrank during the troubled 3rd century AD to two fortified areas: on the right bank of the Saône, at the foot of Fourvière, around the bishop’s estate, and a commercial district around the church of Saint-Nizier on the Peninsula. 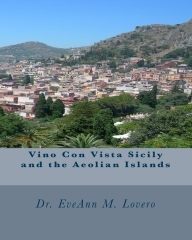 By the mid-15th century it was one of the mostly heavily populated cities in Europe: there were 36 districts, each with its own mercantile attribution, and only the slopes of Croix-Rousse were not densely built on, being reserved for the ‘rural’ villas of rich German and Italian merchants and for vineyards. 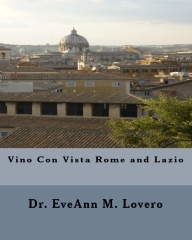 Overpopulation and the risk of epidemics led to the implementation of a policy of planned expansion starting in the mid-16th century and led by the religious orders. 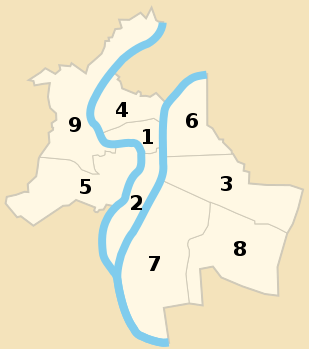 New districts were opened up in the 17th century, in particular the Bellecour area in the south, round the Place Royale (now the Place Bellecour). New projects undertaken in the 18th century involved extensive drainage works to the east and the linking of the peninsula to an adjoining island. During the Revolution, land confiscated from the religious orders became available for building. In 1850 several surrounding communes were incorporated into the city and major roads driven through the centre. The resulting urban fabric, visible today, is an epitome of the development of Lyons, with areas of medieval streets and of 18th-and 19th-century town planning alongside one another. 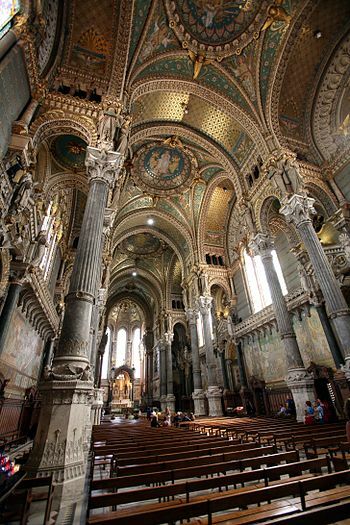 The Roman city is represented by the buildings excavated on Fourvière. The large theatre, capable of seating some 10,000 spectators, was built in the early 1st century AD and reconstructed under Hadrian (117-38). Alongside it is the smaller odeon, seating around 3,000 people and probably built in the mid-1st century. 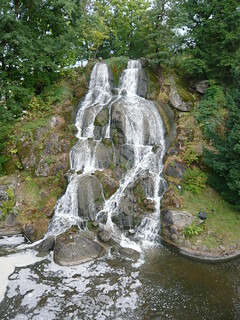 The amphitheatre is on Croix-Rousse hill, and was built around 19 BC to accompany the altar dedicated to Rome and Augustus; it was here that the Council of the Three Gauls met each August. The succeeding centuries are well represented in the rich stock of private residences in Lyons – the Thomassin House in the Place du Change (late 13th century, enlarged 15th century); the house of the poet Maurice Scève (1493; additional storey in the 17th century); the Chamberlain’s mansion (1495-1516), illustrating the transition from Gothic to French Renaissance style; the Mannerist house of the Lions (1647); the classical building on the Quai Lassagne (1760); and the House of 365 Windows, an example of the tenements built for the canuts (silk workers) in the first half of the 19th century. The public buildings include the late 11th-century Manécanterie (Choir School); the Ainay Abbey Church (1107) in full Romanesque style; the noble Cathedral of St John the Baptist (1160-1481), which preserves a remarkable degree of stylistic homogeneity, given the long period over which it was built; the Church of Saint-Nizier, begun in the 14th century,with its Flamboyant Gothic nave, classical Renaissance front, and neo-Gothic south spire; the 17th-18th century Hôtel-Dieu, built over a medieval original; the Loge du Change (1745-80), now a Protestant church; the Fourvière Basilica (1872-96); and the École de Tissage (Weaving School), the work of Modernist architect Tony Garnier (1927-33). There was a Gaulish settlement here as early as the 4th century BC, to the west of the line of hills bordering the Saône. Although the area was marshy at that time, the settlement played an important role in trading with Marseille. 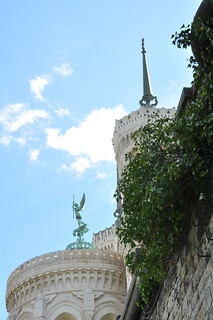 In 43 BC Lucius Munatius Plancus, governor of the Roman province of Gallia Transalpina, founded a town known as Lugdunum on one of these hills, Fourvière; it was granted the high status of colonia by the Senate, giving it important fiscal privileges. With the reorganization of the provinces of Gaul in 27 BC it became the capital of Gallia Lugdunensis and the headquarters of the Imperial government. A network of roads was built spreading outwards from Lugdunum, a factor that contributed significantly to its economic and political supremacy. Lugdunum had a special status, since it was here that the Council of the Gauls met annually. Delegates from all the towns in the three provinces came together at the sanctuary dedicated to Rome and Augustus on the slopes of the Croix-Rousse. Christianity was brought to Lugdunum by the Greeks from Asia Minor who had settled there in large numbers. In AD 177 the Christian community sent a letter to their co-religionists in Asia Minor, giving the names of 48 of their number who had suffered martyrdom in the Croix-Rousse amphitheatre, among them St Pothinus, first Bishop of Lyon. The church was, however, to recover quickly, and Ireneus, the successor of Pothinus, became the first great Christian theologian. In the 5th century this intellectual tradition was maintained by another son of Lugdunum, Sidonius Apollinaris. 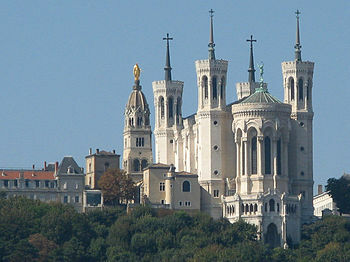 In the period that followed the collapse of the Roman Empire of the West, Lyon survived as an important urban centre, and a number of important monastic communities established themselves there. In 843 it was assigned to Lotharingia by the Treaty of Verdun, and then passed to the Burgundian kingdom. 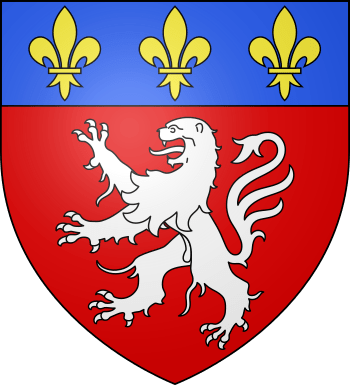 It became the centre of the County of Lyon, the lordship of which was conferred by the Holy Roman Emperor Frederick Barbarossa to the Archbishop of Lyon in 1157. 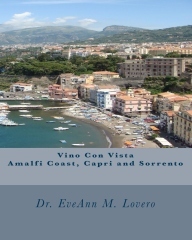 Although small, the County was influential, by virtue both of its independent status and of its commercially and politically strategic location. The Archbishopric was also important, since Pope Gregory VII had conferred the title of “Primate of the Gauls” on its holders in 1078. It was especially favoured by the Papacy, and several pontiffs were crowned there. This independence came to an end in 1312, when Philip the Fair annexed the city to the Kingdom of France. However, its commercial significance was unaffected and it continued to prosper. 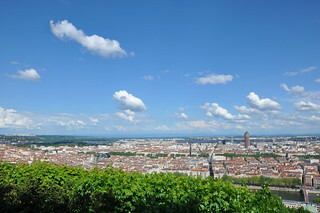 During the first half of the 16th century Lyon also became the base for French political activities in Italy. As a result it was frequently visited by the French court, bringing many artists in its train. During the reign of Louis XI (1461-83) four annual fairs were established, which drew merchants from all over Europe, especially Italy (and Florence in particular). Lyon became a major centre for the spice trade and, even more importantly, the silk trade, following the authorization by François I of weaving privileges, hitherto an Italian monopoly. 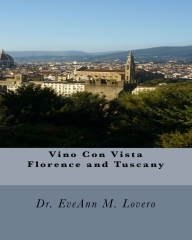 The Florentine immigrants also made Lyon a financial centre for banking and insurance. The first printing establishment was set up in Lyon in 1472, and it quickly became one of the most important printing and publishing centres in Europe, behind Venice and Paris, producing books in Hebrew, Greek, Latin, Italian, and Spanish as well as French. The works of Erasmus, Rabelais, Scaliger, More, Poliziano, and many other intellectual leaders were published by the Württemberger Sebastian Gryphe, who set up in Lyon. When French policy turned away from Italy in the 1550s, Royal visits to Lyon became less frequent. It was also caught up in the Religious Wars and in 1562 was seized by Protestant troops. Lyon was the location of the meeting that resulted in 1601 in large parts of the Dukedom of Savoy being added to the French kingdom. Lyon lost the considerable degree of autonomy that it had hitherto enjoyed around this time, but its commercial and industrial importance was not abated. During the 17th and 18th centuries its pre-eminence in silk production was unchallenged, and inventors like Vaucanson and Jacquard made far-reaching contributions to this industry. The geographical situation of Lyon meant that many artists and architects passed through it on their way to and from Italy, and their influence is plain to see in many buildings of the period, such as the Hôtel-Dieu and the Loge du Change. During the 18th century the expansion resulting from increased prosperity indicated the need for a measure of systematic town planning, and this was carried out by a series of brilliant planners and architects such as de Cotte, Soufflot, Morand, and Perrache. When Napoleon I imposed the use of Lyonnais silk on all the courts of Europe the industry boomed. New tenements with workshops were built for the craftsmen (canuts). 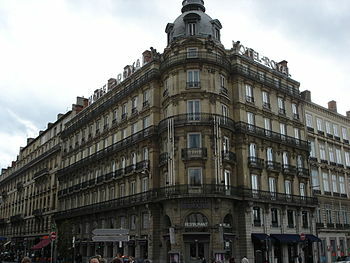 Lyon was to see the first Conseil des Prud’hommes (labour litigation court) in 1806 and the first cooperative grocery store in 1835. Between 1800 and 1848 the number of looms in operation increased tenfold, from 6000 to 60,000, and over 90,000 people were employed in the industry. 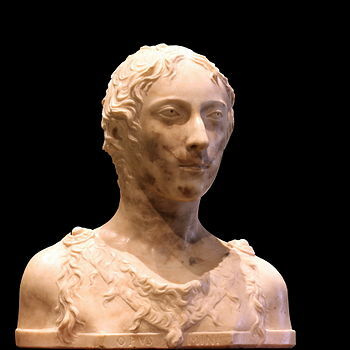 However, relations between the workers who produced the silk and the merchants who sold it were always uneasy, and Lyon also saw the first worker demonstrations in 1831 and 1834. This was to come to an end with the authoritarian policies of the Second Empire. The wealth of Lyon and its worldwide mercantile contacts attracted banks from the Far East to the city as well as encouraging the creation of banking institutions by the Lyonnais themselves. This led in turn to investment in land in Algeria, Madagascar, and southeast Asia: the port of Haiphong was created with Lyonnais investment. 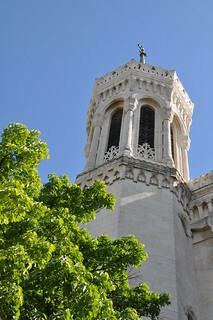 This concern with non-Christian countries outside Europe had another important effect on Lyon, which was to become the leading centre of missionary activities in the Catholic world. The earliest institution to be founded was the Propagation de la Foi (1822), to be followed by bodies such as the Pères Maristes (1836), the Pères des Missions africaines (1856), and the Soeurs de Notre Dame des Apôtres. 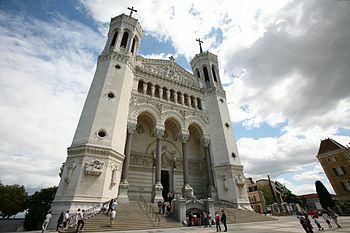 Lyon is also the capital of French Church . Since the early Middle-Age, the head of the French Catholic Church is the Archbishop of Lyon, for that reason officially named ” Le Primat des Gaules” .